Apr. 9, 2015 9:00 a.m.
Metal detecting is a crazy hobby – well, at least that is how many people view those silly guys and gals who are wandering around beaches swinging a metal rod with a sensor on one end and gauges on the other and all connected with a set of headphones. Crazy as it may look, to the enthusiastic metal detectorists, the thrill of unearthing the next treasure becomes very addictive. I have always been a little curious about metal detecting but became thoroughly convinced I had to have a machine of my own after witnessing a friend of mine finding an 1881 US silver dollar at an old site west of Wetaskiwin. It wasn’t long before I bought my first Garrett 150 metal detector. I was excited. Just what I had dreamed of, digging in the dirt and sand and finding those elusive old coins and relics. Thinking back, that was about 30 years, and about 3000 coins, 50 rings, watches, keys and many other treasures ago. I was pretty proud of that very first $149 machine and even prouder when it discovered my first coin. But that was nothing compared to several months later when it made some positive sounding beeps on a beach at Muriel Lake near Bonnyville. I turned up a King George V nickel and was definitely hooked. Recently, when examining some of the rings I have collected for gold and silver content, I became curious about a dirty and corroded brass metal ring. In my mind, it was in the category of, “it’s a ring but nothing very special” until I stuck it under the light and magnifying glass. Inside the band was a tiny engraving that sparked my curiosity and interest; a “U” with and arrow through it and a “7”. After doing some searching on the net, the best I have come up with is it may be aboriginal symbols? The ‘U’ being a person or man, the arrow is an arrow and the ‘7’ is a symbol for a boomerang? Likely very inaccurate, but the best I can come up with so I am appealing to our readers to provide some insight into this mysterious find. With a new metal detecting season about to begin, over the years I have moved up four levels of sophistication of detector and am now sporting a Garrett 2500. My Garrett 1000 still remains as my reliable backup. My detector travels with me from spring thaw to fall freeze-up and provides me with a few minutes of entertainment during a rest stop or several hours of fun and exercise during serious searching at old building sites or on beaches. People ask,”What is the most interesting thing you have found?” This is very difficult to answer but I still wonder, what is the story is behind the wedding band I found by a group campfire in a residential camp? Or how did the person who lost their large set of keys get home and into their house? Or what did the lady feel when she noticed her ring with 16 diamonds was missing? I will never likely know the answers to those questions but I do have a feeling of satisfaction when seeing those happy faces after my metal detecting efforts returned the lost special ring, bracelet, keys or other valued items. Every find is a treasure; even some of the junk can provide a historical message. Mine includes coins dating from 1910 to the loonies and toonies of today; rings, watches and other jewelry, key sets, badges, shell casings and numerous other artifacts. Perhaps the most interesting find, was a totally unexpected one. I had thrown a variety of coins in the grass on my front lawn in Wetaskiwin to fine-tune my new Graphic Target Imaging Garrett 2500 detector. 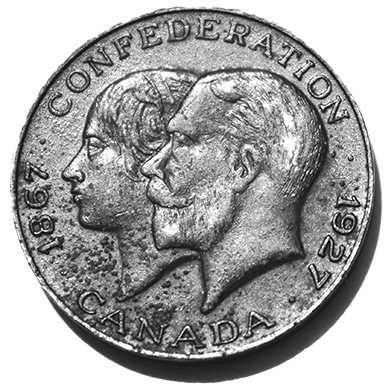 I started to find the nickels, quarters and loonies I had seeded, but my astonishment, amongst them was an 1867-1927 Confederation coin buried beneath the grass on my very own front lawn. Who knows, maybe this year will turn up an older coin, a ring with more diamonds, or a more interesting artifact. Regardless, I am looking forward to another season of metal detecting and the healthy and relaxing three mile walks and numerous knee bends during each outing. If you would like more information about this exciting and relaxing hobby, feel free to contact me at big_mac@telusplanet.net.